I'm working with a development board based on Freescale i.MX6 ARM Cortex A9 processors. You can have more info about the board on this link. The Android version I'm using is the one provided by the manufacturer which is based on Android 4.4.2 if I'm not wrong. This will have an automotive application, which will be the Head Unit of a kind of car. At this moment, the board takes about 15-20 seconds to boot. As you know, this is unacceptable for a car infotainment system. I've developed several Android apps but this is the first time I'm playing with the internal system, and I need some help to achieve this. But it hasn't have any effect. I've seen few manufacturers have achieved to start the system in 4 seconds. As far as I know this option is present in 4.4.2. So you want the device to be ready as soon as you enter your car and have a good power consumption. 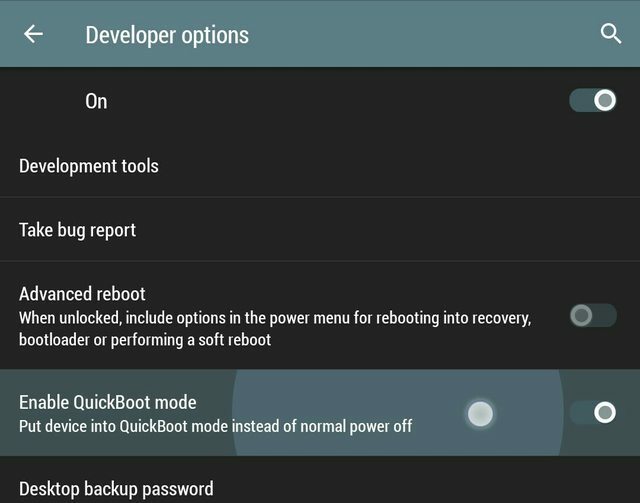 you probably want to use the "QuickBoot mode" (not the same as fastboot mode) which doesn't really turn the device off if you choose "shutdown", but gets it into some sort of power saving mode. on my mobile phone it will be there after ~1 second. Enable the QuickBoot setting: You can find this option under the "Developer options" nearly at the top. Turn on the device: Push and hold the power button, after around 1 or 2 seconds, the mobile phone should be usable again. Note: I know I'm using CyanogenMod 12.1 but it's not that different and I found this feature in my stock Android 4.4 ROM too. The screenshots looks different because of a theme in place. Not the answer you're looking for? Browse other questions tagged boot performance or ask your own question. How does a tablet automatically power on when a power source is connected? Tablet with very long boot time, what can I try?